araromotemeno = fully assembled – ponikijo = painted crimson. Due to the truncation on the right hand side of this Linear B tablet it is impossible to state whether there is only one or more chariots listed. one chariot ? fully assembled equipped with bridles with leather blinkers and horn bits decorated with ivory inlays and painted crimson. Apart from a single error Rita made in line 2 of this tablet, having misread the second syllabogram as -mu- instead of -qi-, consequently misinterpreting -iqiyo- as -Imuyo- ( a person’s name) instead of – iqiyo - = a chariot, her translation is convincing and elegant, as is to be expected from a Linear B translator of her advanced skills. That error has been corrected in the translation above. It goes without saying that the right-truncated ideogram for -chariot- to the right of the tablet between lines 1 and 2 must mean a chariot with wheels, as  a chariot without wheels cannot conceivably be fully assembled, equipped and decorated. 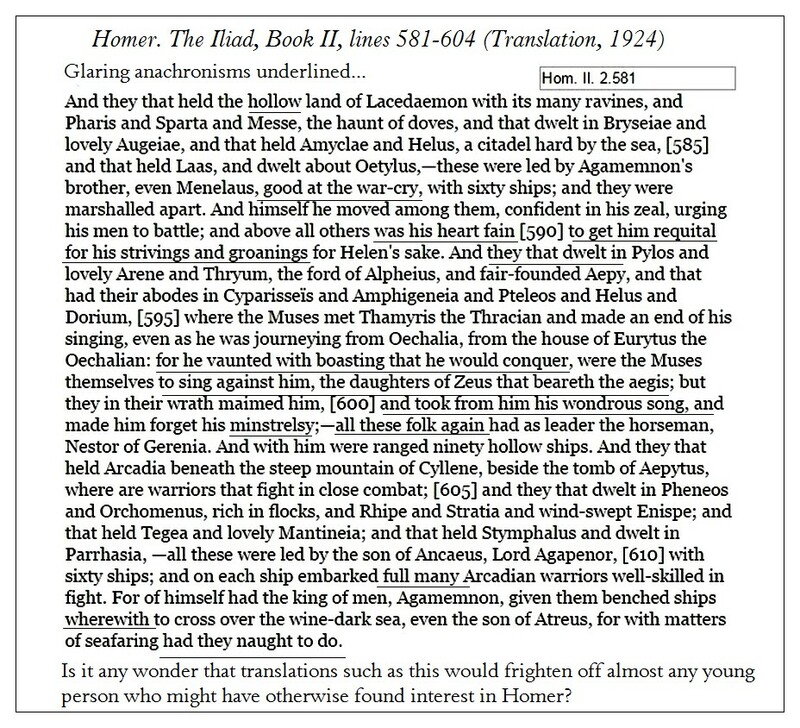 While the archaic Greek may appear somewhat difficult or abstruse to linguists who specialize in Classical Greek, it is really not so bizarre after all, since we find many parallels in Homer’s Iliad, especially in The Catalogue of Ships in Book II. Notice that the gender of the word for chariot is fluid, i.e. not yet fixed in Mycenaean Greek. Moreover, this word is archaic in the extreme, having disappeared completely from Homeric and Classical Greek. Nevertheless, its meaning is clear from the context of all tablets on which it appears, since on most of them it is juxtaposed with the ideogram for chariot. In my notes on the archaic Greek, you will notice that the (second) aspirated a in the Greek for – kerayapi – is aspirated in the archaic Greek. 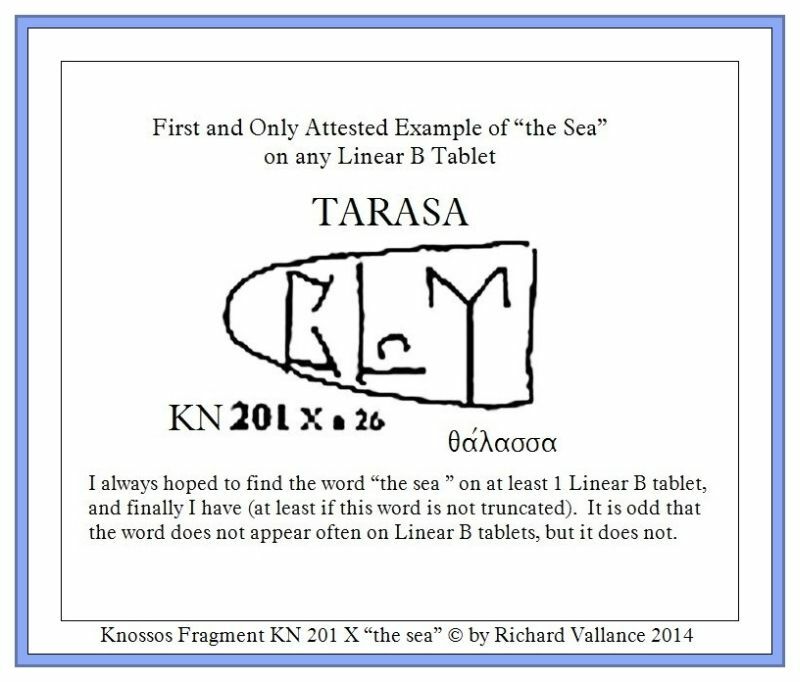 This orthography does not correspond to the spelling on this tablet, but in Chris Tselentis’ excellent Linear B Lexicon the alternate spelling – kerahapi – is  attested as an alternate standard. 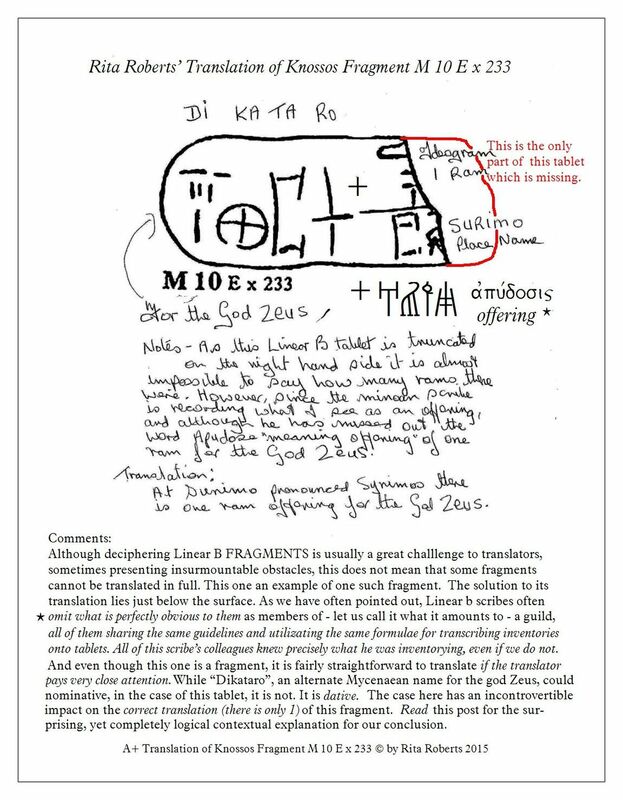 NOTE: If you are a researcher in Linear B, it is highly advisable that you read and thoroughly digest this post in its entirety, as it constitutes a major milestone in the exegesis of my Theory of Regressive Linear B Grammar & Vocabulary. Failure to read this post may result in an inability to further confirm or reject, either in whole or in part, the premises upon which my entire theory rests. 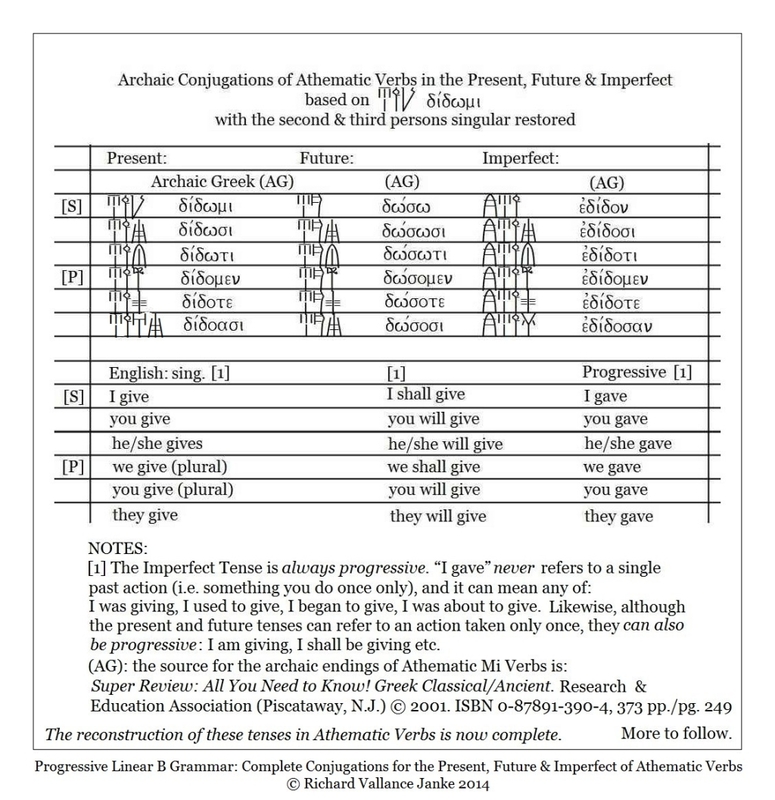 Athematic – MI –verbs are shared in large part by Greek and and Sanskrit, respectively the Occidental & Oriental agnates or close/near descendents of the same extremely ancient (proto-) Indo-European class. All verbs of this athematic class invariably share the standard ending –  mi –  in the 1st. person sing. of the present tense. Ancient Greek and Indic (Sanskrit) are similar in many respects, which may strike some as surprising since they cross the hypothetical “satem/centum” line, which the Occidental sub-class (all ancient Greek dialects & Latin & its dialects) treats the Proto IE gutturals as hard (Gr.e9kato/n Lat. centum = 100,) as against Sanscrit, chatam, and Old Persian, satem. But there are so many structural affinities, from parallel verb forms down to musical pitches, that some special connections must have existed between and prior to these two groups, which appear to have almost certainly sprung from the same Proto IE ancestral language. On the other hand, while Sanskrit is normally considered solidly IE, less than 40% of Greek vocabulary and grammar appears to derive directly from Proto IE roots, giving rise to the hypothesis that other extra-structural factors are surely involved in the evolution of ancient Greek. This phenomenon, peculiar to Greek alone, may also have significant implications for the eventual decipherment of Linear A. But this is mere speculation on my part. Still... you never know. At any rate, I intend eventually to follow this avenue of approach, my small contribution to the eventual decipherment of at least a tiny substrate (superstrate?) of Linear A sometime in 2016. Athematic MI verbs are characterized, for the most part, by their own unique set of endings, although the 2nd. and 3rd. plurals are virtually the same as those of the Thematic so-called “regular” verbs in ancient Greek. It would appear, then, that “regular” verbs retained the athematic 2nd. and 3rd. plurals of their ancestors, the athematic Mi verbs, while casting all other athematic endings aside. The most striking phenomenon of MI verbs is reduplication in the present tense, which is restricted to perfect formations of “regular” thematic verbs in ancient Greek. This state of affairs raises two critical questions in my mind:  are so-called “regular” verbs in ancient Greek derived from the more ancient athematic  MI verbs, or did they simply borrow the athematic endings of the athematic 2nd. and 3rd. plurals the ancestral MI verbs? Later this year, I shall demonstrate the apparent yet quite possibly significant link between the SI endings of the present indicative and san endings of the perfect indicative in both classes of verbs, thematic and athematic. Another truly striking similarity between the more archaic and early “regular” forms in Homeric Greek is the sharing of the SI ending in the dative plural. I am highly inclined to stress the statistically probable significance of these endings, in both their verbal and nominal forms, shared by their more ancestral and and early “regular” forms in both Mycenaean and Homeric Greek. This phenomenon will re-appear frequently in both the attested [A] and derivative [D] forms of the 3rd. 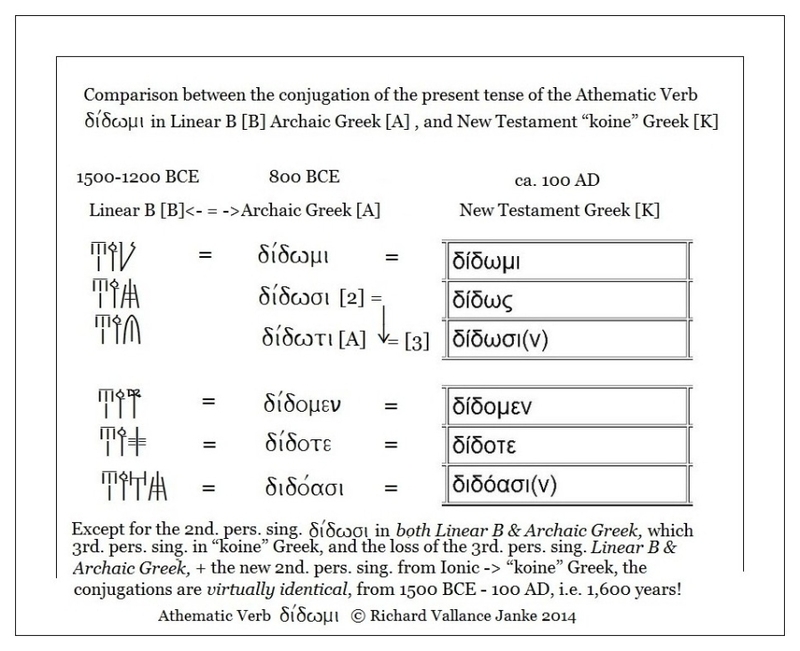 person plural of all verbs, thematic or athematic regardless and in the SI ending of the dative plural, not only in Homeric, but also in Mycenaean Linear B, which attests to their extreme antiquity in ancient Greek. The fact that these forms were already fully developed in Mycenaean Greek strongly points to the likelihood that they arose from the earliest ancestral (proto-) Greek of Mycenaean and Homeric Greek alike (above all in the Catalogue of Ships in Book II of the Iliad). 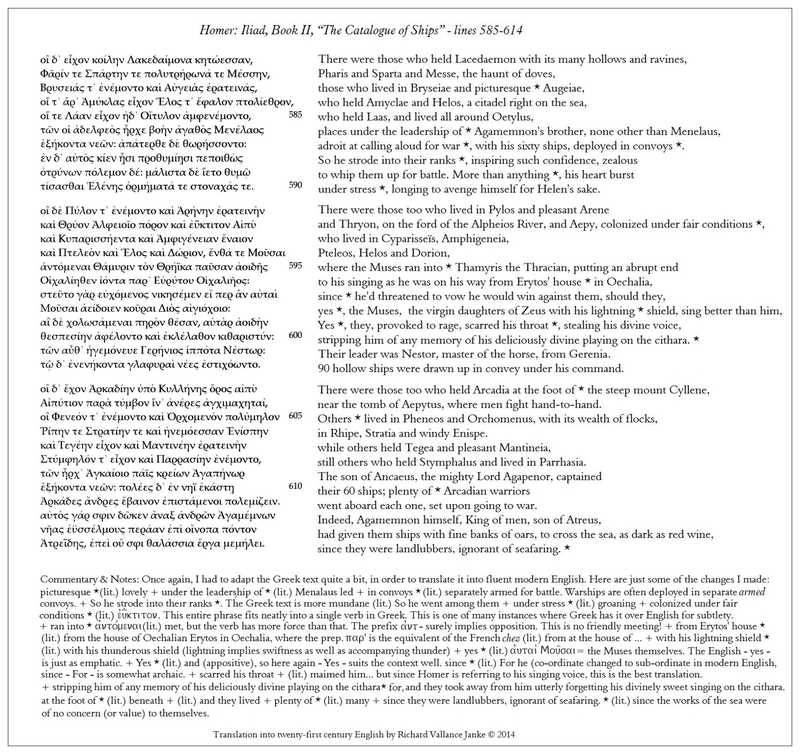 All of these grammatical constructs are already firmly rooted in Mycenaean and Homeric Greek, giving rise to my hypothesis that it is not only possible, but highly feasible to regressively reconstruct huge chunks of Mycenaean Greek grammar and vocabulary from their (quasi-direct) descendent, the Homeric Greek of (the Catalogue of Ships) of the second Book of the Iliad. All of this raises another hypothetical question in my mind: did there exist ancestral forms of thematic verbs in ancient Greek which shared all or most of their endings, in all tenses, with their (apparently) more ancient MI counterparts, giving rise to the hypothesis that both athematic and thematic verbs were derived from even more ancient verbal constructs, in which all remotely ancient (proto-) Greek verbs were in fact athematic? That this is possible, and even probable, is reinforced by the uncontested fact that in Sanskrit both MI and O verbs alike share reduplication, meaning there is no marked distinction between “thematic” and “athematic” verbs in Sanskrit, in other words, they are of one and the same class. This phenomenon then reappears in a restricted number of Latin perfects, like tutudi from tundo "beat", old tetuli from thw stem tul- which supplements the forms of Latin. fero (Gr.fe/rw ). Since Latin developed in parallel with ancient Greek, but independently from the latter, this then raises the question yet again, how on earth can it be that such reduplication occurs in Latin but not in Greek, unless there is a possibility (however remote) that reduplication occurred in both thematic and athematic verbs of their proto-Greek and proto-Latin ancestors? If indeed that is the case, then it would appear that proto-Greek and proto-Latin shared this seminal characteristic with not only Sanskrit, but proto-Sanskrit, and hence, by inference, with the proto IE ancestor of all three of these languages. If this is that case, it necessarily follows that both the thematic O endings and athematic MI endings share one and the same singular ancestor, which must have been neither thematic nor athematic, but one and the very same root of both classes. So I have to wonder out loud whether thematic O and athematic MI verbs in Sanskrit, Mycenaean Greek and Homeric Greek alike all derive from a single class of verbs, embodying the characteristics of both of these classes of verbs. If that is even remotely a possibility, then we cannot afford to ignore it, since it allows us to regressivly reconstruct, to some degree at least, even some of the tenses of the Proto-IE ancestor of all of these languages. Wouldn't that be a revelation? Of course, all this is speculation on my part, but I love to indulge in speculative hypotheses, if there is even a remote chance that someday some of them may prove to be sound. Only time and future refinements in the science of linguistics may lend some credence to the hypotheses I am making here. If anything, computational linguistics and the great leaps in the application of artificial intelligence to linguistic theory (-ies) are likely to give rise to even more speculative hypotheses, hypotheses which may yet prove to rest on a much more solid foundation in applied linguistics than we can hope to approach at present. We shall see. 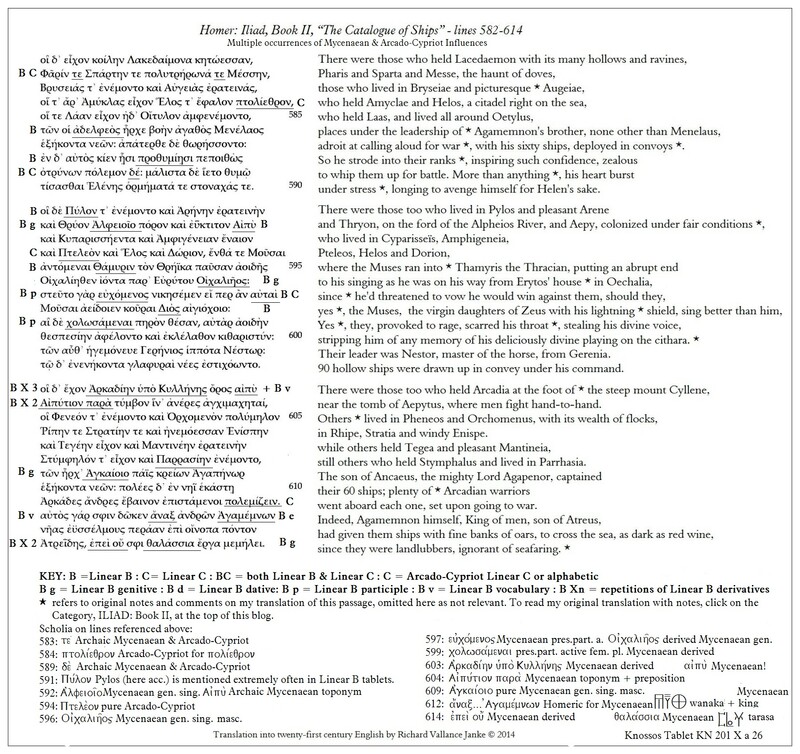 In other words, the foundation of my theory of the Regressive Reconstruction of Mycenaean Linear B grammar and vocabulary rests firmly on the regressive extrapolation of all such forms from he Homeric Greek of (the Catalogue of Ships) of the second Book of the Iliad or from any of the following dialects, Cypriot Linear C (above all others), Aeolic, Arcadian and early Ionic Greek, all of which appear to have been (quasi-) direct descendents of Mycenaean Greek. Doric Greek does not properly enter into the equation. 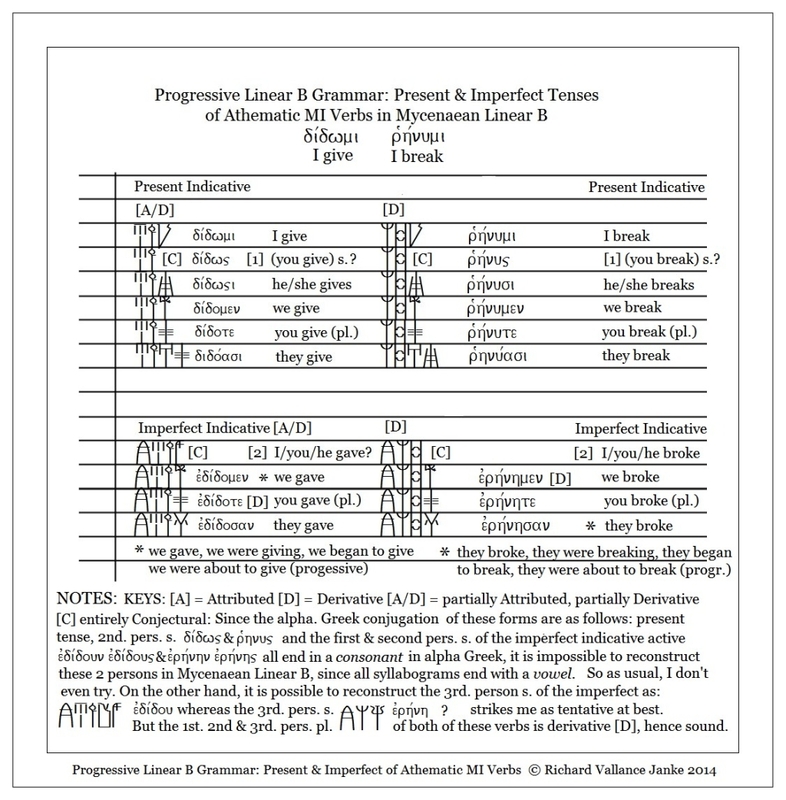 On thing, however, is certain: the athematic – mi – verbs, in all tenses & moods, and in the all-pervasive participial constructions in ancient Homeric Greek must have been already firmly entrenched in Mycenaean Greek, from the simple observation of the facts, namely, that at least some these forms of all tenses, moods and participles are already almost all attested [A] on Mycenaean Linear B tablets. And even where some forms of all tenses, moods and participles in verbs are not to be found on any Linear B tablets, enough of them are attested for us to be able to reasonably reconstruct them in their entirety or at least in part from the attested forms. And what applies to verbs, applies also to all other parts of speech in Mycenaean Linear B (nouns, adjectives, adverbs, prepositions and even formulaic phrases shared with Homeric Greek). These happily fortuitous antecedents in Linear B to their later counterparts in Homeric Greek recur quite frequently enough for me to be able to regressively reconstitute the Linear B forms from their subsequent Homeric forms. This, in a nutshell, is the entire premise of the Theory of Regressive Linear B as I intend to clearly demonstrate in the reconstruction of large chunks of ancestral Mycenaean Greek grammar and vocabulary, both attributed [A] and derivative [D] from its direct descent, Homeric Greek, and in particular the frequent occurrences of archaic Greek in Book II of the Iliad, in which in turn even more archaic forms frequently recur in the Catalogue of Ships (lines 484-789), the most reliable source for ancestral Mycenaean Greek grammar and vocabulary in the entire Iliad. Concomitantly, and once again happily, any of the following dialects, Cypriot Linear C (above all others), Aeolic, Arcadian and early Ionic Greek also well serve the purpose as direct and indirect descendents of Mycenaean Greek, from which it is feasible to regressively extrapolate grammatical and terminological constructs in Linear B.  Doric Greek, however, does not enter into the equation, since the Dorian invasion transpired after the fall of Mycenaean civilization.